We’d love your help. Let us know what’s wrong with this preview of Ghost Stories by Leslie S. Klinger. The ghost story has long been a staple of world literature, but many of the genre's greatest tales have been forgotten, overshadowed in many cases by their authors' bestselling work in other genres. 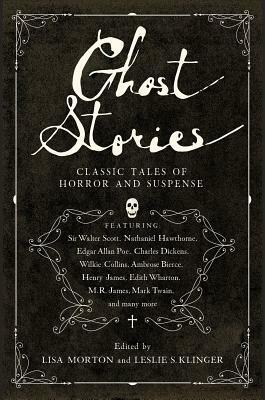 In this spine-tingling anthology, little known stories from literary titans like Charles Dickens and Edith Wharton are collected alongside overlooked works from masters of horr The ghost story has long been a staple of world literature, but many of the genre's greatest tales have been forgotten, overshadowed in many cases by their authors' bestselling work in other genres. In this spine-tingling anthology, little known stories from literary titans like Charles Dickens and Edith Wharton are collected alongside overlooked works from masters of horror fiction like Edgar Allan Poe and M. R. James. Acclaimed anthologists Leslie S. Klinger (The New Annotated Sherlock Holmes) and Lisa Morton (Ghosts: A Haunted History) set these stories in historical context and trace the literary significance of ghosts in fiction over almost two hundred years—from a traditional English ballad first printed in 1724 through the Christmas-themed ghost stories of the Victorian era and up to the science fiction–tinged tales of the early twentieth century. In bringing these masterful tales back from the dead, Ghost Stories will enlighten and frighten both longtime fans and new readers of the genre. To ask other readers questions about Ghost Stories, please sign up. The ghost story has long been a staple of world literature, but many of the genre's greatest tales have been forgotten, overshadowed in many cases by their authors' bestselling work in other genres. In this anthology, little known stories from authors like Charles Dickens and Edith Wharton are collected alongside overlooked works from masters of horror fiction like Edgar Allan Poe and M. R. James. As I've said before I love anthologies, they give you a quick look at different authors and how they The ghost story has long been a staple of world literature, but many of the genre's greatest tales have been forgotten, overshadowed in many cases by their authors' bestselling work in other genres. In this anthology, little known stories from authors like Charles Dickens and Edith Wharton are collected alongside overlooked works from masters of horror fiction like Edgar Allan Poe and M. R. James. As I've said before I love anthologies, they give you a quick look at different authors and how they write. The stories in this anthology have been around for awhile but I have never read any of them, but I'm glad I was able to. I don't think stories like these will ever get old, they will still send chills up the spines of many generations to come. SWEET WILLIAM'S GHOST is a classic ballad about a ghost visiting his love who is still alive. I read this out loud to myself and it really had more of an impact then when I just read it in my head, it's definitely a great story. THE FAMILY PORTRAITS by Johann August Apel is a story about a man traveling to check out his marriage prospects, when he is invited to join a group of women telling ghost stories. He hears the story of Juliana, a girl who is terrified by a family portrait. This is a story that gives you a very uneasy feel but you can't put it down, this is one of my favorites in the collection. LIGEIA by Edgar Allan Poe his story follows an unnamed man and his wife Ligeia, she ends up ill and dies. The man remarries but his second wife ends ill and dies also, guys pretty unlikely. He decides to stay with his wife's body, that's when things get strange. I've always liked Poe but this is the first time I've read this story. I really liked this one, it's right up there as one of my favorite stories in the collection. THE SUBSTITUTE by Georgia Wood Pangborn is about a woman getting a surprise visit from an old friend, a story that proves a mother's love is endless. It was very well written and had great descriptions. The ghost story – standard fare of sleepovers and camping trips, and was probably one of the first stories told when man started communicating. From the day humans learned of death, they have looked for ways to understand it, and to hope that it isn’t really the end. The thought of loved ones coming back to silently (or not so silently) visit us provides some with hope, while scares the hell out of others. Many have claimed to see these specters of the dead (myself included), while many turn to The ghost story – standard fare of sleepovers and camping trips, and was probably one of the first stories told when man started communicating. From the day humans learned of death, they have looked for ways to understand it, and to hope that it isn’t really the end. The thought of loved ones coming back to silently (or not so silently) visit us provides some with hope, while scares the hell out of others. Many have claimed to see these specters of the dead (myself included), while many turn to science to disprove such claims. Regardless, the ghost story will be around in various forms for as long as humans have the capability to tell them. What we have forgotten is that some of the best ghost stories were written centuries ago, lost to either time, or just forgotten among the plethora of other stories the author may have written. For example, we all know of Dickens’ most famous ghost story, “A Christmas Carol”, but how many can recall reading (or even hearing about), “No. 1 Branch Line: The Signalman”? Not many, I’m willing to bet; and that’s a shame. Apparently Lisa Morton and Leslie Klinger thought so as well, because they took it upon themselves to put together this collection of eighteen eerie, creepy, atmospheric tales of the dead coming back – sometimes to help, sometimes to hinder, sometimes to pass on wisdom, or just to scare the bejeezus out of someone. Lisa, and Leslie, did a fantastic job of finding these treasures, and managed to get just the right mix of terror, heartache, and yes, even humor (thank you Mark Twain). I’d love to write a review of every story, but due to the nature of the stories, I would be doing the authors, and the readers a serious injustice. These gems are meant to be savored and enjoyed, with no knowledge of what to expect. Leslie S. Klinger is considered to be one of the world’s foremost authorities on those twin icons of the Victorian era, Sherlock Holmes and Dracula. He is the editor of the three-volume collection of the short stories and novels, THE NEW ANNOTATED SHERLOCK HOLMES, published by W. W. Norton in 2004 and 2005, winner of the Edgar® Award for Best Critical/Biographical Work and nominated for every othe Leslie S. Klinger is considered to be one of the world’s foremost authorities on those twin icons of the Victorian era, Sherlock Holmes and Dracula. He is the editor of the three-volume collection of the short stories and novels, THE NEW ANNOTATED SHERLOCK HOLMES, published by W. W. Norton in 2004 and 2005, winner of the Edgar® Award for Best Critical/Biographical Work and nominated for every other major award in the mystery genre. THE NEW ANNOTATED DRACULA, published by W. W. Norton in 2008, delivers promises a similar in-depth examination of Bram Stoker’s haunting classic and its historical context. Since the 1960’s, the study of the rich fantastic literature of the Victorian writers has been Klinger’s consuming passion. He has written dozens of articles on Sherlockiana, published more than a dozen books on Sherlock Holmes and Dracula in addition to the Norton works, and regularly teaches UCLA Extension courses on Holmes and Dracula. He and Laurie R. King have co-edited three anthologies of stories inspired by the Sherlock Holmes Canon, the latest being ECHOES OF SHERLOCK HOLMES, published by Pegasus Books. In addition, he has edited a number of anthologies collecting original and classic detective and vampire tales. His groundbreaking THE ANNOTATED SANDMAN, a panel-by-panel examination of Neil Gaiman’s near-legendary “Sandman” comics. Given unprecedented access to Gaiman’s scripts and based on hours of conversations with the author, Klinger adds hundreds of notes describing historical sources, literary and popular cultural references and illuminates the characters and milieu of the rich stories. Published by DC Comics, the first volume appeared in January 2012; the remaining three were published in 2013, 2014 and 2015. His THE NEW ANNOTATED H. P. LOVECRAFT, highly praised and nominated for various awards, was published by W. W. Norton in 2015. He is currently working on THE ANNOTATED WATCHMEN for DC Entertainment, to be published in July 2017, as well as THE NEW ANNOTATED FRANKENSTEIN, which will appear from W. W. Norton in July 2017. In a completely different genre, Klinger and Laura Caldwell have co-edited a searing, heartbreaking true-crime anthology ANATOMY OF INNOCENCE: TESTIMONIES OF THE WRONGFULLY CONVICTED, to be published by W. W. Norton in March 2017. The volume pairs major mystery/thriller writers with exonerees to tell their harrowing tales.